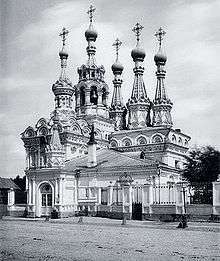 The Tsardom of Russia (Русское царство or Российское царство), also known as the Tsardom of Muscovy, was the name of the centralized Russian state from assumption of the title of Tsar by Ivan IV in 1547 until the foundation of the Russian Empire by Peter the Great in 1721. 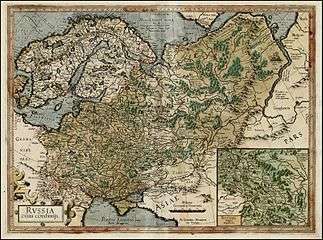 From 1551 to 1700, Russia grew 35,000 km2 (about the size of the Netherlands) per year. 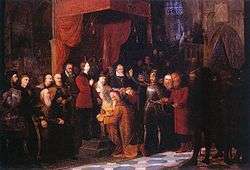 The period includes the upheavals of the transition from the Rurik to the Romanov dynasties, drawn-out military conflict with the Polish–Lithuanian Commonwealth as well as the Russian conquest of Siberia, leading up to the 42-year reign of Peter the Great, who ascended in 1682 and transformed the Tsardom into a major European power. After a military victory over Sweden and Poland, he implemented substantial reforms and proclaimed the Russian Empire (Russian: Российская Империя) in 1721. 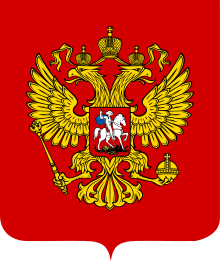 While the oldest endonyms of the Grand Duchy of Moscow used in its documents were Rus' (Russian: Русь) and the Russian land (Russian: Русская земля), a new form of its name, Rusia or Russia, appeared and became common in the 15th century. 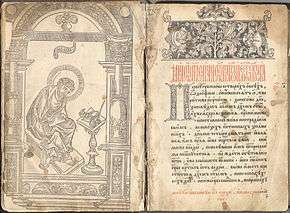 In the 1480s Russian state scribes Ivan Cherny and Mikhail Medovartsev mention Russia under the name Росиа, Medovartsev also mentions "the sceptre of Russian lordship (Росийскаго господства)". 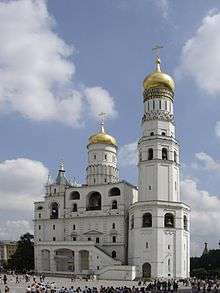 In the following century Russia co-existed with the old name Rus and appeared in an inscription on the western portal of the Transfiguration Cathedral of the Spaso-Preobrazhensky Monastery in Yaroslavl (1515), on the icon case of the Theotokos of Vladimir (1514), in the work by Maximus the Greek, the Russian Chronograph written by Dosifei Toporkov (?–1543/44) in 1516–22 and in other sources. In 1547, Ivan IV assumed the title of “Tsar and Grand Duke of all Rus'” (Царь и Великий князь всея Руси) and was crowned on 16 January, thereby turning the Grand Duchy of Moscow into Tsardom of Russia, or "the Great Russian Tsardom", as it was called in the coronation document, by Constantinople Patriarch Jeremiah II and in numerous official texts, but the state partly remained referred to as Moscovia (English: Muscovy) throughout Europe, predominantly in its Catholic part, though this Latin term was never used in Russia. 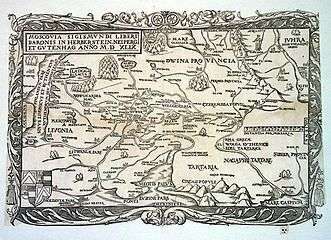 The two names "Russia" and "Moscovia" appear to have co-existed as interchangeable during the later 16th and throughout the 17th century with different Western maps and sources using different names, so that the country was called "Russia, or Moscovia" (Latin: Russia seu Moscovia) or "Russia, popularly known as Moscovia" (Latin: Russia vulgo Moscovia). 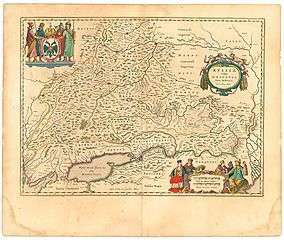 In England of the 16th century, it was known both as Russia and Muscovy; Giles Fletcher, author of the book Of the Russe Common Wealth (1591), and Samuel Collins, both of whom visited Russia, were familiar with the name Russia and used it in their works. 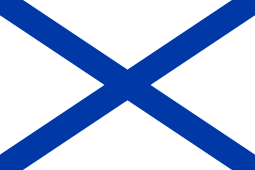 In the Russian Tsardom, the word Russia replaced the old name Rus' in official documents, though the names Rus' and Russian land were still common and synonymous to it, and often appeared in the form Great Russia (Russian: Великая Россия), which is more typical of the 17th century, whereas the state was also known as Great-Russian Tsardom (Russian: Великороссийское царствие). 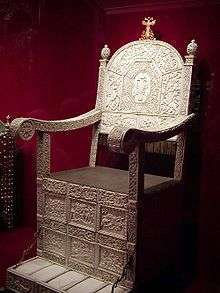 At first, the Byzantine term autokrator expressed only the literal meaning of an independent ruler, but in the reign of Ivan IV (r. 1533-1584) it came to mean unlimited rule. 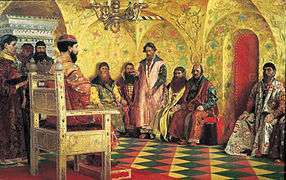 Ivan IV was crowned Tsar and thus was recognized, at least by the Russian Orthodox Church, as Emperor. 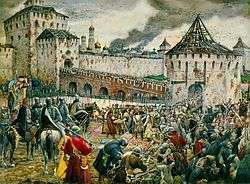 Philotheus of Pskov claimed that after Constantinople fell to the Ottoman Empire in 1453, the Russian Tsar was the only legitimate Orthodox ruler, and that Moscow was the Third Rome because it was the final successor to Rome and Constantinople, the centers of Christianity in earlier periods. That concept was to resonate in the self-image of Russians in future centuries. 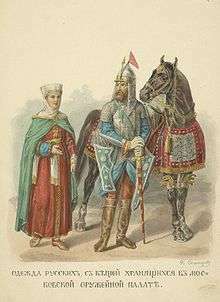 According to a popular theory, the oprichnina was started by Ivan in order to mobilize resources for the wars and to quell opposition to it. Regardless of the reason, Ivan's domestic and foreign policies had a devastating effect on Russia, and they led to a period of social struggle and civil war, the so-called Time of Troubles (Smutnoye vremya, 1598-1613). ^ Cite error: The named reference Civil was invoked but never defined (see the help page). 1 2 Population of Russia. Tacitus.nu (30 August 2008). Retrieved on 2013-08-20. ↑ Monahan, Erika (2016). "Russia: 3. Tsardom of Muscovy (1547-1721)": 1–6. doi:10.1002/9781118455074.wbeoe425. ↑ Paul R., Magocsi (2010). A History of Ukraine: The Land and Its Peoples. University of Toronto Press. p. 223. ISBN 978-1-4426-1021-7. Retrieved 19 August 2016. ↑ Lee Trepanier. Political Symbols in Russian History: Church, State, and the Quest for Order and Justice. Lexington Books, 2010. P. 61: "so your great Russian Tsardom, more pious than all previous kingdoms, is the Third Rome"
↑ Barbara Jelavich. Russia's Balkan Entanglements, 1806-1914. Cambridge University Press, 2004. P. 37. Note 34: "Since the first Rome fell through the Appollinarian heresy and the second Rome, which is Constantinople, is held by the infidel Turks, so then thy great Russian Tsardom, pious Tsar, which is more pious than previous kingdoms, is the third Rome"
↑ Maija Jansson. England and the North: The Russian Embassy of 1613-1614. American Philosophical Society, 1994. P. 82: "...the towns of our great Russian Tsardom", "all the people of all the towns of all the great Russian Tsardom". ↑ William K. Medlin. Moscow and East Rome: A Political Study of the Relations of Church and State in Muscovite Russia. Delachaux et Niestl, 1952. 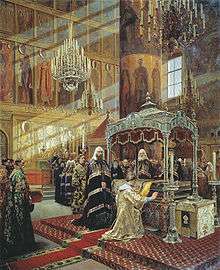 P. 117: Addressing Patriarch Jeremiah, Tsar Feodor Ivanovich declares, "We have received the sceptre of the Great Tsardom of Russia to support and to watch over our pious and present Great Russian Tsardom and, with God's grace". ↑ Кудрявцев, Олег Фёдорович. Россия в первой половине XVI в: взгляд из Европы. Русский мир, 1997.